This plug-and-play system is pre-configured to work directly with widely used telephone switches including AT&T, Avaya, Comdial, Intertel, Iwatsu, Lucent, Panasonic, Samsung, Toshiba and Vodavi. The SOHO Flash system is programmed and maintained through the Telephone User Interface (TUI). It has both a built-in modem and console (null modem) port for troubleshooting and modifying system/mailbox configuration. The SOHO Flash can be easily customized to operate with almost any telephone system that supports analog voicemail integration. 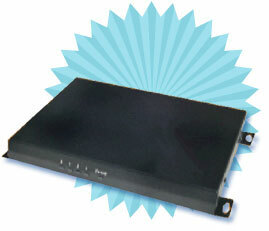 Built-In Modem: The SOHO Flash features a built in modem for remote access. To invoke the modem dial #*# on any of the voicemail ports. Once connected, user can view system activity, see on-screen tracing, customize system files, and even download/upload files. Null Modem Access: This system can be accessed via null modem. Once connected, user can view system activity, see on-screen tracing, customize system files, and even download/upload files. Extension Field Values for Mailboxes can be changed via Telephone: The extension field of a mailbox can now be changed via Telephone User Interface (TUI). Mailboxes can be configured to transfer to external telephone numbers using a limited number of tokens within the extension field (as long as the telephone system supports external call transfers). Directory (411): Caller has the option to enter the first few letters of the first or last name of the person they’re calling, and press * to be transferred to that person or # to search for another match for their entry. Continuous Play: While logged into mailbox user can press 78 to hear all messages one after the other. Continuous Delete: While logged into mailbox user can press 76 to delete all messages. Quick Greeting Bypass: While listening to a greeting, user can press the # key once to bypass the greeting. Automated Attendant: Functions as a main, backup or off-duty attendant. Extensions can be dialed directly or caller may use an employee directory to locate individuals by first or last name. Simple, single-digit selections can be configured for easy and quick access to main departments. Direct Message: Provides the caller with a way to leave a message for a user without having to ring their extension. Private Message: A message can be marked private, which makes the message unable to be forwarded to other persons. Transfer: After leaving a message, caller has the option to dial another extension or department, or to reach the receptionist/supervisor. Audio-text: Configurable “information-only” mailboxes accommodate caller access to any pre-recorded information. Provides 24-hour access to frequently asked questions ranging from hours of operation, address and directions to promotional materials or product-specific information. Data/Time Stamp: Every message gives date and time the message was recorded. Message Forwarding: After hearing a message user can forward a copy of the message to another user. A message prefix can be attached to the forwarded message. Message Future Delivery: After a message has been recorded, Amanda can be told when to deliver that message. Mailbox Lists: Each user can build 3 private mailbox lists to allow the sender to easily broadcast a message to multiple users. Message Notification: Users can be notified when they receive new messages via MWI, pager, outside number (such as a cell phone) or internal extension. Multiple-User Greetings: Each user can record three different greetings. These personal greetings can be changed or scheduled automatically by time of day and weekday or weekend. Fax Tone Detection: The system can detect and route a fax transmission to a designated fax extension.